Mostyn Moreno Foundation receives recognition for their recent sponsorship of the 2014 ReelAbilities: Houston Disabilities Film Festival. The Glenda Jean Mostyn and Joe E. Moreno Educational Foundation (Mostyn Moreno Foundation) received recognition for their recent sponsorship of the 2014 ReelAbilities: Houston Disabilities Film Festival. 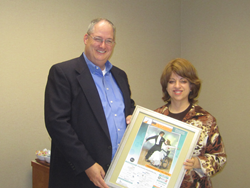 Rachel Davis, the chief development officer at Jewish Family Services of Houston presented Monte Osburn, executive director of the Mostyn Moreno Foundation, a nicely framed, personalized copy of the festival poster. Additionally, Ms. Davis provided festival participant survey feedback on the success of the festival. More than 3,300 people attended film festival event. Over 90% stated their perceptions of individuals with disabilities changed after watching a film with 99% reporting the films as either good or very good. In addition, more than 650 area students attended screenings this year. With over 30 sponsors, 30 collaborating partners and more than 100 volunteers, the film festival was able to screen 9 films at 11 venues and provide exposure for 17 artists. To learn more about Mostyn Moreno Foundation, please visit http://www.mostynmoreno.org. Mostyn Moreno Foundation was created in 2006 by Houston trial lawyers Amber and Steve Mostyn to honor the memory of two caring Texans: Glenda Jean Mostyn, mother, grandmother, sister, and East Texas educator and Texas State Representative Joe E. Moreno, son, brother, friend, and legislator. Both cared very deeply about education and providing the best for children of Texas. Our focus is specifically on children with special needs and supports our community through our “Christmas Lights,” “Community Connections,” and our “V.I.P. Day” programs.